Earn up to 2,480 reward points. Outfit your mini pedal setup with a tour-grade board, power and cables. Don't let its small size fool you. Nano+ is the foundation of some very powerful rigs. 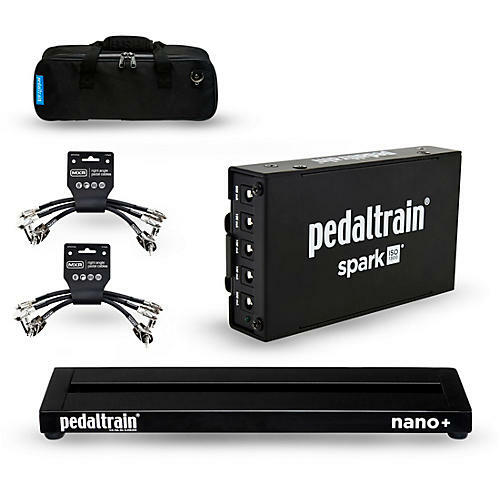 Nano+ is Pedaltrain' only two-rail pedal board system. Nano+ is ultra-compact and portable. Nano+ is similar to its little brother, Nano, but with 4 more space (for just a few more pedals) and Pedaltrain's modified rail spacing. Even the smallest pedals grab hold of Nano+ and will not let go. Made of featherweight aircraft-grade aluminum, Nano+ includes 36 (92 cm) of Pedaltrain's professional-grade hook-and-loop pedal fastener and plenty of zip ties for securing cables. Included with purchase is Pedaltrain's redesigned fitted soft case (featuring a heavy-duty metal zipper and reinforced stress points). Spark from Pedaltrain is the smallest, most powerful power supply in its class, featuring an innovative, patent-pending mounting system. Spark mounts under all Pedaltrain models in 60 seconds, no additional tools required. Spark has five isolated outputs totaling 1300mA of power. The unit features a toroidal transformer, professional magnetic shielding, short-circuit protection on all outputs, internal fuse protection, and is switchable for worldwide use. It's compatible with aftermarket voltage adaptors for 18V output and will power most world-class, high-draw digital pedals. MXR Patch Cable 3-Pack, 6 in. These 6 in. patch cables are MXR-approved for clean, pure tone. They feature oxygen-free copper conductors and spiral shields to block unwanted interference, PVC outer jackets for flexibility and protection, and flat, low-profile right-angle ends to keep your pedalboard tight and tidy.